McAllen Personal Injury Lawyer | Law Offices of Ramon Garcia, P.C. 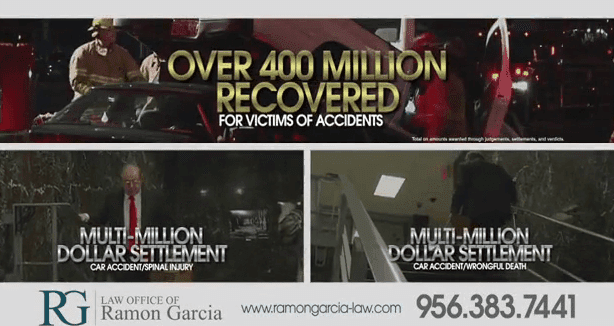 The Law Offices of Ramon Garcia has been fighting for the injured for over four decades. Whether the negligent party responsible for your injury brought harm to you or a loved one by way of an auto or trucking accident, premises liability, product liability, or a workplace injury, you deserve justice and maximum compensation for any harm endured. The Law Offices of Ramon Garcia bring over 40 years of insight and experience in the area of personal injury law. Our skilled personal injury lawyers in McAllen have recovered half a billion for injury victims in the area and throughout Hidalgo County. We put our clients first in everything that we do, and we take the cases that we handle seriously. When you turn to our firm, you are guaranteed to receive the top-notch representation that you deserve. With our large staff, there is more than enough personalized care and individual attention to go around. Our firm believes that all injury victims should have access to professional attorneys, which is why we take cases based on whether we can actually help versus the size or scope of your legal matter. Seek Justice for Your Injury. When the Law Offices of Ramon Garcia came to be more than 40 years ago, we started our firm with pure intentions of helping Texas injury victims seek justice for their injuries and maximize their recoveries. Fast forward to today, with over half a billion recovered for our past clients, it is safe to say that we have done right by our mission. Attorneys Ramon Garcia, Emerson Arellano, Juan Carlos De Leon, Orlando Garcia, and Sonia Lopez are a force to be reckoned with inside and outside of the courtroom. As skilled personal injury lawyers and fearless trial advocates, our legal team knows and has what it takes to turn situations around for the better when you have been harmed by another's negligence. All of our attorneys have a strong local presence in the Texas legal community. Respected by our peers and by court officials, we have a solid reputation for compassionate advocacy and effective legal abilities. When injured clients turn to our firm, they know going in that they are in proven, capable, and trusted hands. Why Turn to the Law Offices of Ramon Garcia?